The Cadieux Bicycle Club has a long history of supporting bicycle racing, racers, and the cycling community in general. 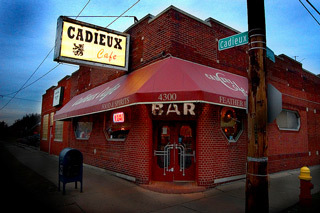 The club was founded on February 12, 1965 at the Cadieux Café in Detroit, MI . The founding members were Robert (Bob) Devos, proprietor of the Cadieux Café and former amateur racer in Belgium, his brother-in-law Frank Van Laeken, Al Roels, a former bicycle racer and often called “Minute A Mile Al” for accomplishing the mile in a minute on rollers, and Adolf Lincklau (Buff), also a former bicycle racer and local bicycle shop owner. Being of Belgian descent and residing in the predominantly Belgium section of Detroit’s eastside, their goal was to stimulate interest in bicycling – especially racing – among the local population. A license was obtained from the Amateur Bicycle League of America, now known as USA Cycling, and the club promoted a local race and began to train young racers. 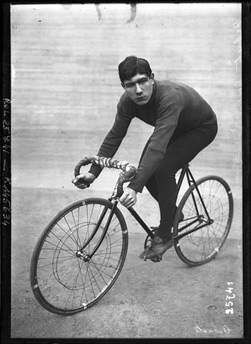 Gerard Debaets pictured in this 1913 photo of a pre-race warm-up. The first race was held at Belle Isle in 1965 under the direction of Adolf Linclau, and dedicated to the memory of Gerard Debaets. Debaets was a former world-class bicycle racer who won a variety of major races in Belgium and was also victorious in 17 six-day races in the United States and Canada. Gerard Debaets died on April 27, 1959 in Haledon, New Jersey at the age of 60. His brother Michel was active for many years in the Cadieux Bicycle Club, he also had a glorious career in bicycle racing. Michel died July 30, 1970 at age 82. After Michel’s passing, the race became the Gerard-Michel Debaets Memorial Race (1970-1977). When club founder Bob Devos passed away on February 24, 1978, the race was renamed the Debaets-Devos Memorial Race. Over the years Bob Devos worked tirelessly to promote cycling, especially racing. With a background in road racing in Belgium, he was a forerunner in the advancement of cycling in the United States. Not only did he promote road races, he also organized professional six-day races at the State Fair Grounds and Cobo Arena in Detroit. In 1966 the race was held at Chandler Park in Detroit and remained there until 1983 when it was held on Washington Boulevard in Detroit. From 1985-2005 the race was held with the start/finish line in front of the Cadieux Café. In 2006 the race was held at The Palace of Auburn Hills. The race has been held in it current location at Cross Creek Industrial park since 2007. While the Debaets-Devos race has continued to be a major focus of the club since its formation, the club has continued to grow in both size and the scope of its involvement in the cycling community. In 1987 Antoon’s Bicycles became the title sponsor of the club and it was during that year that Mt. Bike racing became part of the club’s cycling interests. During the late 1980’s and early 1990’s the Antoon’s Bicycles / Cadieux Bicycle Club Mt. Bike team was one of the most successful teams in Michigan. 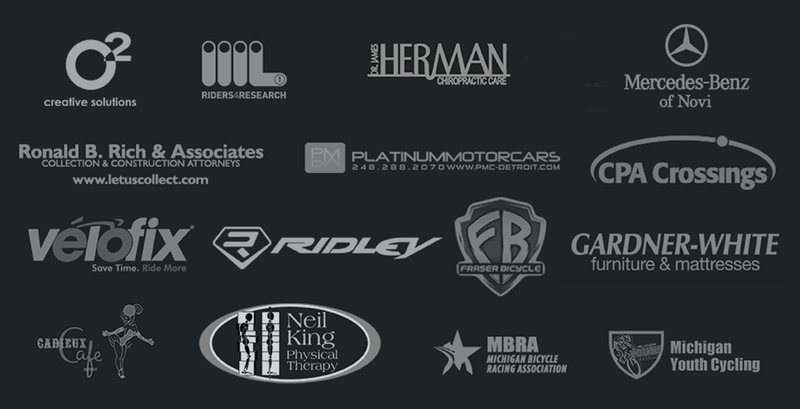 In 2005 O2 Creative Solutions took over as the main title sponsor and the club has continued to grow. Team O2 / Cadieux Bicycle Club now has, in addition to the road racing team, a track team, a cyclocross team, a Mt. Bike team, and a touring group.